In what way does the Bible claim at be the genuine, inspired word of God? 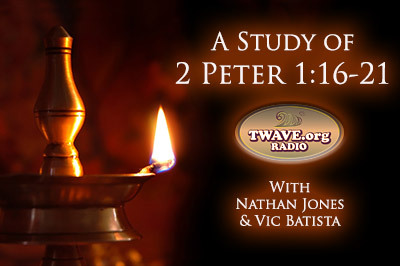 Nathan Jones: Let's read 2 Peter 1:20 because it is such an important verse. "No prophecy of Scripture is of any private interpretation, for prophecy never came by the will of man, but holy men of God spoke as they were moved by the Holy Spirit." This is a two-fold message. First off, Peter is saying that the Bible is the inspired Word of God. In other words, what Peter is writing here isn't just what his own thoughts are on the subject, but rather the Holy Spirit is guiding him to write this. Peter is not the author; God is the author. Then there is the second part of the message concerning the interpretation of the Bible. The verse says that there is no prophecy of Scripture that is of any private interpretation. So, when you hear someone say, "God told me last week that this verse really means this now," and he is the only guy who holds this view, that is a private interpretation. Don't listen to this person! Vic Batista: This verse should serve for us a barometer for people to help them discern when they hear of extra-biblical prophecies supposedly happening, so they don't jump on the bandwagon. First look at what the Bible has to say about said prophecy, and secondly see what other credible teachers are teaching about this view. Those are ways we can check to make sure our understanding of prophecies are on the right track. Nathan Jones: Exactly, for it is very important that we have discernment in this age. Satan is trying to drown the message of God with all these false teachings and private interpretations so that people will finally give up on their faith. And, Brother, it's working! The strategy is working very well. Churches are giving up on doctrinal soundness and losing their steam about the coming of Jesus Christ. Without that focus, and without knowing what your destination is, you'll drive all over the place and get lost. Churches likewise are driving all over the place doctrinally and getting lost. Their people are no longer excited about the Lord's return, so they are slipping into immorality and are missing the point. That's why Peter here is declaring to people that they need understand that the Bible is the real deal — the very word of God. And so, believers in Christ really need to study God's prophetic Word, for in truth it has a large role in our understanding of who God is. Vic Batista: Bible prophecy can be properly understood when we follow biblical guidelines. It's not like God wants us to live in darkness, right? It's not like He doesn't want us to understand Revelation? Nathan Jones: Not at all, and yet a lot of pastors will give up trying to learn and teach Revelation. A lot of people will read their Bibles, but when they get to Revelation, they just give up. Neither will get in there and do that dirty word called study. We have to study in order to understand. We also must not follow the private interpretation of a few individuals who come up with these unbiblical theories about the end times. They present all these numerical calculations for all that is going on in Revelation, or tie Tribulation events to past World Wars. Just study the Word! Use the Bible to explain the symbols that come up in the text, and the message of God becomes very clear when you read the Bible literally. Let the Holy Spirit do the studying for you. Vic Batista: That's why I find it somewhat humorous when we read verse 21. "For prophecy never came by the will of men but holy men of God spoke as they were moved by the Holy Spirit." I can just imagine some of these Apostles like John who wrote Revelation by the Holy Spirit. He is writing the words down all the while shaking his head and saying, "Okay, Lord, I'm writing all this down you told me to write, but I've no clue as to what exactly I am saying!" Nathan Jones: Crazy, right, and especially when you read the Old Testament Prophets. They were given messages by God, but you could tell from the text that they didn't understand much of the prophetic parts. Daniel even asked the messenger angel in Daniel 12 basically, "Hey, I don't understand this at all. Can you explain this to me?" But the angel says, "Daniel, this isn't for you to understand. This prophecy is about the future. Seal up these words, for they will be understood when the time comes." These prophets at times didn't know what they were writing about. They really didn't understand at times, because who would be able to write about a prophecy some 2,500 years ago or more and look at our time period and understand what is going on today? They just couldn't! They couldn't have come up with these prophecies, for they really couldn't have invented some of the events that they were told about hundreds of years in advance. Daniel didn't understand how knowledge would increase in the end times, or how travel would increase in the end times. How would he know about computers and cars and airplanes? Life pretty much up to the last century has been lived the same way for hundreds of years. Now we live in the most knowledgeable time period in all of human history, and the most traveled time period. Vic Batista: Can you imagine if you were living 2,000 years ago and the Lord showed you an iPhone or a text message? Nathan Jones: Think about some of the visions these prophets were given. They were seeing the wars of the end times that involved tanks, planes, helicopters, and nuclear weapons. They were given visions of such devastation on this earth that they couldn't have ever dreamed it up. How in the world does humanity get to this point? They just couldn't understand modern-day technology. I feel sort of sorry for the prophets as well. Again and again God, or Jesus Christ Himself, or the messenger angel, would have to say, "It's not for you to know. You will not understand this at this point in history." To compare, just think that even ten years ago we wouldn't have known what an iPhone was. Vic Batista: Peter in this passage says the Holy Spirit is the One who is teaching us and revealing to us what the Scriptures mean. We can move forward in the faith by trusting and believing that if God wrote it and put it in His Word, well I might not understand it now, but I am certainly going to believe it. Nathan Jones: The Holy Spirit is essential to understanding God's Word. The Holy Spirit will nudge the unbeliever, whom the Bible says are like the dead. We are like dead people spiritually without Jesus Christ's salvation. As dead people we cannot understand the Bible. If you hear someone say that they read the Bible and it was all nonsense, then the Holy Spirit was not guiding them. If you are diligently looking for God, and if you are seeking God, and then you read the Bible, the Holy Spirit promises that He will guide you to the answers. The answer is almost always tied to salvation and God's glory. This understanding comes by accepting Jesus Christ as your Savior. After you are saved, the Holy Spirit will continue to guide you in your understanding of prophecy, and especially as you study with others who are already well studied and are ready to help you learn. Vic Batista: The reason we share Bible prophecy is to lead people to salvation, for God's Word shows us how to be saved from the punishment of our sins and to lead a newly revived life alive in Jesus Christ.